Please help me to use my device. I installed the system, everything works well, except for touch. There is a SKU: Z-0017 touchscreen that is factory set to Raspberry Touch. This works so well that it does not have to calibrate under Raspberry. After installing Emteria OS, the touch does not work. I need to touch. Please help with the solution. Touch is optionele on the SKU: Z-0017. Is that touch over USB or gpio? Seems touch over gpio is not an option? Nu sure, I have a reactions on a post about gpio touch screens working or not . I tested with a 7 inch screen once and that worked fine. It came with some instructions for the config.txt and I used those and that worked fine for me. It did not pick up on my resolution out of the box unfortunately. I did not have any touch problems. Did you use this kind of screen? And the emteria under Os? As I mentioned under Raspberry, it works brilliantly without any special adjustments. This operation ceases after installing Emteria Os. I tried to do this in the description after installing Os, but it was unsuccessful. The solution should be there. Development in touch operation. I accidentally found that touching in RECOVERY mode works like a dream. Restarted from RECOVERY mode, when OS is loaded, the touch is reconnected and unreliable. Does anyone know how to resume operation in RECOVERY during OS? Professionals can certainly solve it. This is a very high task for me. I was upgraded to the latest version - 0.6.0 but the touch quality did not change. The solution is located in RECOVERY, it works the touch as it should. The solution can only be done by anyone who wrote a program. I hope to read my post and resolve this long-awaited problem. How is it connected? HDMI or DSI? What exactly is not working in emteria.OS? Just touch? Is the picture OK? I add: I have a version of 0.5.21 now, in RECOVERY the touch function is wonderful but not good on the system. It senses the touch, but it works back and forth, it can not be used. It senses the touch, but it works back and forth, it can not be used. Ok, the touch is working, good to hear that. What do you mean by "works back and forth"? Are touch events flipped? Yes, it senses the touch, but is insecure. You can not work with him. However, it works well during RECOVERY. I could help? Combining back means insecurity, it does not do what I touched. Or you have to touch or react multiple times. It is difficult to explain that I am not the mother tongue, the translator is not really good. What do you mean by "insecure"? Where does it work where it does not work. Once you have a tapping, you have to tap more times. He is saying that the single touch works in recovery boot correctly but not in the normal boot. @obero is this a usb touch screen ? Well, the same kernel with the same drivers is used in the recovery and in Android. Please check the kernel log for details. Thank you for dealing with the problem, Unfortunately I don't know where the kernel log is located, please specify where you are located. I would have another problem. The 0.6.0 is on my machine with a good quality 32Gb SD card with an original raspi screen. The screen resolution is 800x480, the quality is very bad. I enclosed 2 pictures that you can see well. It freezes during operation and needs to be restarted. Hi @obero, freezing of RPI with display 800x480 is discussed here: https://forum.emteria.com/discussion/574/cron-gpu-memory-discussion#latest. @Martin , Thank you for your help, I will try what you have suggested, but the bigger problem is the quality of the image and its resolution. Sometimes the picture is uncomfortable, very confusing. There is definitely some solution. 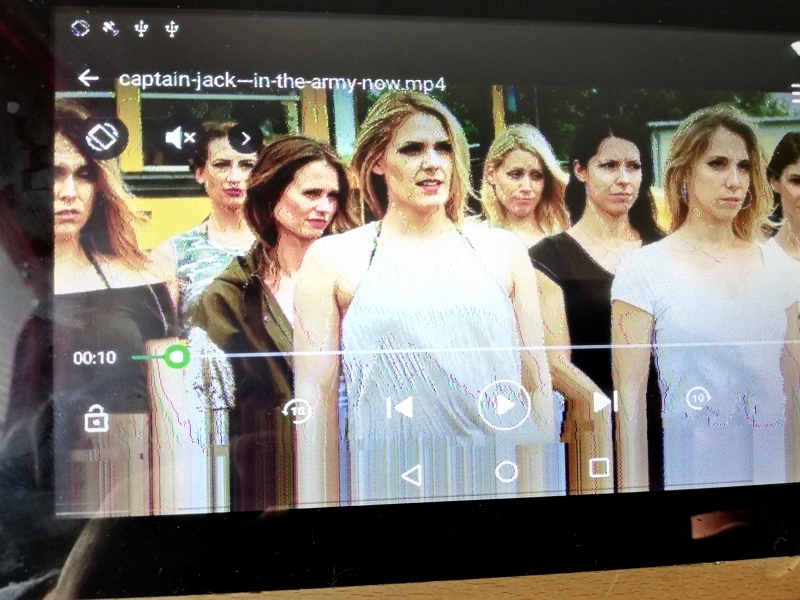 Is there no solution for improving the screen resolution? And doing OCing will also burn out the board a lot faster. I think everyone is confused with the word "overclock" and "turbo". What people here call overclocking is NOT overclocking. initial_turbo is only a burst of speed at boot time set at X seconds. This is NOT overclocking. FYI - Also if you are using a 3B or 3B+ you won't see much difference and the people at Raspberry suggest not doing it as their is a possibility of at least a dead board and at worse causing a fire. And this software isn't meant to be used as a gaming or other high usage app. Be warned ! !